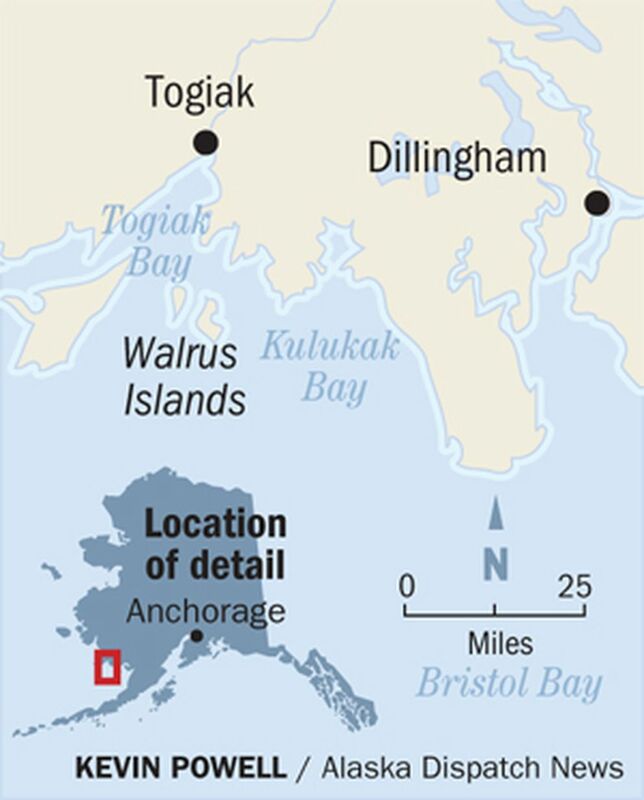 WASHINGTON — Interior Secretary Sally Jewell on Wednesday announced designation of a historic landmark in Southwest Alaska's Walrus Islands. The new designation doesn't change much about how the islands are managed by the Alaska Department of Fish and Game, according to authorities with the National Parks Service and the state. But it does offer new potential future stream of federal funding. 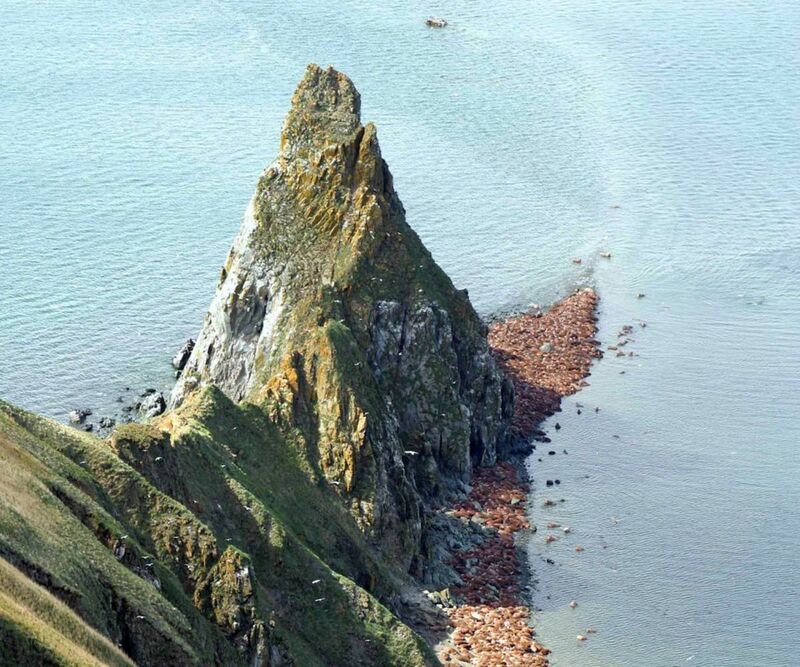 The "Walrus Islands Archaeological District … is one of the few remaining places with evidence of human occupation of the Bering Sea continental shelf when sea levels were substantially lower than at present," the Interior Department said in the announcement. "At least 6,000 years ago, the earliest inhabitants of Round Island, one of seven islands in the district, were marine-adapted and practiced more generalized settlement and subsistence patterns, including hunting walrus on the beaches, than previously recognized by Alaska researchers," the Interior Department said. The Alaska landmark was one of 24 new National Historic Landmarks designated this week. The program, run by the National Park Service, offers technical assistance and funding to a selection of more than 2,500 landmarks in the United States. "These 24 new designations depict different threads of the American story that have been told through activism, architecture, music, and religious observance," Jewell said in a statement. The islands will be listed in the National Register as historic landmarks, but the Alaska Department of Fish and Game can still do whatever it likes with the property, said Jeremy Barnum, a public affairs officer with the National Park Service. The Walrus Islands sit near the entrance to Togiak Bay and are already home to the Walrus Islands State Game Sanctuary. The designation offers "no changes" to management of the islands, said Alaska Department of Fish and Game Wildlife biologist Ed Weiss. It "probably opens the door to some additional funding opportunities and assistance from the Park Service," he said. Weiss didn't know the site had been selected until he started getting emails Wednesday morning, he said. But he was certainly aware that it was an option: "This has been a multiple-year process" involving the federal government and the state Department of Natural Resources and historic preservation office, he said, musing that the process began, conceptually, at the tail-end of the George W. Bush administration. The park service is subject to budget cuts like any other agency, but the agency could potentially find federal funding for "providing educational materials or interpretive stuff … I think this program would open the door," Weiss said. Unlike other recent moves by the Obama administration in the Bering Sea region, Wednesday's designation does not provide any new layers of protection for the island, Weiss said, likening it to having one's house added to a historic registry. "There's a clause in there that would allow us to opt out," he said. "It's a beautiful place. One of our natural wonders. One of many," Weiss said of the islands. Currently, the state requires a permit for visitors to Round Island. In the summer, a walrus haulout on Round Island is available on a live feed.